Simple & Sweet.... and so contemporary.... so timely with the changing times and practical situations. It almost reflects the reality yet in a very lighter vein. Excellent! very close to reality... I loved this cartoon. Real Story in Metro city's. Mirror to reality. This is really excellent. close to reality in big cities. Very interesting insight into managers doublespeak The traffic depiction in the cartoon is incidental. This could apply to any scenario!!! This is excellent. Coming very close to reality. HYD is slowly moving into this 'TRAFFIC JAM' situation. Well done cartoons, BAHUT MAJA AAYA! 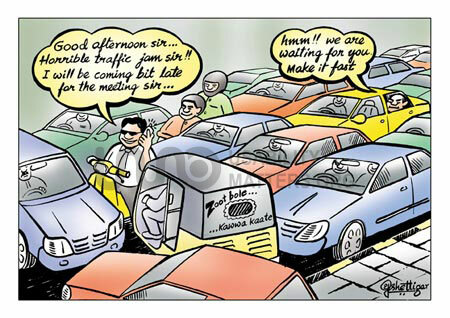 It gives an idea of the state @ 'Panjagutta Circle', Hyderabad @ 9 am and @ 6 pm. Nice cartoon. Excellent cartoon. Infact it is the most in everybody life. Hmmm..cant take this excuse anymore since people have seen this cartoon. Jokes apart, this is a reflection of reality. I second all the others who have commented on the cartoon. It is a great way to put things in a picture form. Also the real culprit (Auto in the cross direction) is also shown as a suttle message. fact in india..!! really good one..who is the liar...? the real one is auto..always .. This is really cool.....close to reality. very nice. This we can see everywhere in India. very nice. A good respresentation of "Slice-of-life" situation... excellent detailing. Accomplishes its purpose of eliciting a chuckle from the reader. Good going Yogish! Ho!! nice idea, i think this in Hyderabad.